"In Harm's Way" designers. Front row, from left: Maricel Lloyd, Josh Kassing, Lee Cagley. Back row: Miranda Spears, Alex Ausenhus; Yongyeon Cho, Zhenru Zhang, Nathan Thiese. Photo by Christopher Gannon. Larger image. AMES, Iowa -- If you think interior design is all about paint colors, fabric swatches and furniture styles, think again. Students in an Iowa State University graduate studio have propelled interior design to a place it's never been before: the 21st century combat outpost. Students in the advanced experimental studio class created environments that support combat soldiers' mental health and help alleviate post-traumatic stress disorder. (PTSD). Their designs balance privacy and connection, relaxation and security, meditation and activity. The 1920s cots (yes, they're still used), standard-issue tents and hanging-poncho privacy dividers are replaced with individual spaces that soldiers can personalize and control. Communal spaces are strong and masculine; personal spaces are soft and soothing. Believed to be the only class of its kind, "In Harm's Way: Interior Design for Modern Combat" is the brainchild of Interior Design Professor and Chair Lee Cagley. "I've been working on this for several years, since watching a TV feature on PTSD. Soldiers returning from Iraq and Afghanistan spoke eloquently about the fact that they were never able to relax; the outpost tents never felt really safe. They couldn't talk about their fears or feelings and felt that their needs were not valued," he said. "It struck me that what they were talking about was fundamentally an interior design problem — the combat outpost environment wasn't supporting the troops emotionally," Cagley said. "The idea for the class was to rethink the outpost so the combat experience can be mitigated in some way by the environment." The logistics — like getting site plans for a typical forward base in an active combat zone — have been tricky, Cagley said. But "once it happened," members of ISU's ROTC have "cooperated enthusiastically." Retired Air Force civil engineering technician Joseph Pasquantino, Hartford, Connecticut, helped move Cagley's idea forward. While in the military, Staff Sgt. Pasquantino was part of the engineering unit that designed and set up tent cities for bases in forward deployed locations, beginning with Desert Shield/Desert Storm. He provided the class with extensive information on combat-forward base requirements and design, which have not changed significantly since World War I, according to Cagley. Pasquantino has remained involved with the class, attending reviews throughout the semester. "Anyone who has been deployed knows there is no privacy, no escape from the job. And as hard as the military tries to provide some rest and relaxation, a few days here and there really doesn't help," Pasquantino said. "Being able to provide a customizable space for a soldier or airman to escape to daily would greatly improve their quality of life and possibly reduce the effects or occurrence of PTSD," Pasquantino said. 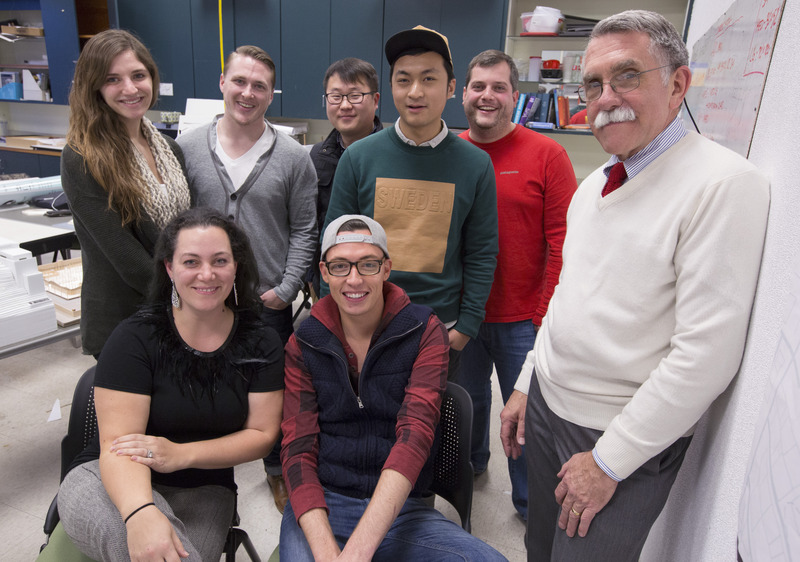 The six interior design grad students in the class are Yongyeon Cho, Josh Kassing, Maricel Lloyd, Miranda Spears, Nathan Thiese and Zhenru Zhang. Alex Ausenhus, an industrial design grad student interested in the topic, is working on a separate, but compatible, device design (see sidebar). The students researched and documented their design process while creating a combat outpost for 144 soldiers in about 2022. They were asked to design environments unlike anything else, using technologies and materials not yet widely available. Their designs had to include all operations of a typical base — from laundry, billeting and mess hall to armory, helipad and medical. The class visited Camp Dodge to see a practice outpost facility used for set-up and teardown training prior to the Iraq War. Master Sgt. Christopher Shaiko, Sgt. 1st Class Joey Bowman, and Human Resources Assistant Mike Tate (all with ISU ROTC) spoke to the class about what it's like to be in a combat-forward position and the inadequacy of current outposts. One student designed an underground Zen Center with space for a chapel and private reflection; another used technology that enables soldiers to control their environment through light and sound. Another student conceived of acoustical seclusion for a soldier using headphones, but with a transparent fabric partition to prevent total isolation. One vernacular design used color and form to blend the base into its surroundings and another designed a camouflage city under one roof to protect the identity of base functions from overhead attack. Yet another student designed flexible structural elements that can be manipulated according to the interior space's function. Several students converted wasted vertical space into useable living space and specified modular components to simplify manufacturing, shipping and installation. Some called for blast-resistant materials to increase safety. Others proposed courtyards and gardens and moved bathrooms and showers closer to the billeting area. Cho's social area and bunk design. "All the solutions are remarkably different from one another," Cagley said. "They've been done with an eye for advanced experiential — they may not be the most practical, but they're the most forward thinking." Although grad student Lloyd is a veteran, she was not deployed into combat. Her husband was, however. And he lived in the combat outpost in Mosul, Iraq. "Interior design is about the experience [of an environment] so it's perfect for finding a solution to this problem," she said. "PTSD is something you can't see or fix for the person. But creating a space where they can feel safe — yet connected to battle buddies — is an important solution our studio can offer to mitigate PTSD." While Lloyd admits that her familiarity with the effects of war might be an advantage in the class, she said her knowledge of the military's conventional approach to problem solving is a hindrance. "A lot of the creative process that goes into design is fostered by the ability to see beyond conventional solutions. But dealing with the military's standard operating procedures left me with blinders of practicality. That's been my challenge in this class," Lloyd said. For Josh Kassing, the class has presented a different challenge. "I was completely illiterate about what a military operation looks like. I've never had to put myself in a tent in an active combat zone. What does it look like at night? Does it feel like a home or a safe place?" Kassing said. "I had to understand that before I could do the design. Putting myself into a situation that I would never normally be in has been interesting and really different from our other usually luxurious design projects. We're putting ourselves into an inherently difficult position and then designing for it. It's complex to negotiate," he said. And that was an intended lesson of the class. "They've learned that design isn't necessarily just a discretionary spend. Design can genuinely save life, and perhaps even prevent some of the needless suicides," Cagley said. "The students have taken an entirely different look at what interior design in particular is capable of, and how the profession can claim a significant stake in shaping the future of our country and the lives of its citizens. It's clear they've discovered how socially relevant and urgently needed their skills actually are," he said. Cagley and Industrial Design Assistant Professor Will Prindle will apply for a grant from the Department of Defense to design and construct some prototypes of the students' designs at Camp Dodge. If all goes well, a design-build studio will do the work in the spring of 2017. Students in an Iowa State graduate studio have propelled interior design to a place it's never been before: the 21st century combat outpost. They created environments that support combat soldiers' mental health and help alleviate PTSD. "In Harm's Way: Interior Design for Modern Combat" is the brainchild of Interior Design Professor and Chair Lee Cagley. It is believed to be the only class of its kind. An outpost billet in Afghanistan. From Military Videos. Private bunk designed by Yongyeon Cho. Alex Ausenhus, an industrial design graduate student, is "in an orbit around us, working on a device design that is compatible with the concepts of this class," said Lee Cagley, interior design professor and chair. His design for an application that addresses post-traumatic stress disorder (PTSD) head on is "genius and thoughtful," Cagley said. As Ausenhus learned in his historical research, the mental health condition was called "nervous exhaustion of yellow bellies" in the Civil War; "battle fatigue" necessitating dishonorable discharge in World Wars I and II; and shell shock in the Vietnam era. In the 1980s, the condition became known as PTSD. Between 15 and 30 percent of soldiers returning from combat in recent years suffer from PTSD. Ausenhus created an app that allows soldiers to orally record a completely confidential account of daily events, including how they felt during and after a battle. It's designed to help soldiers get through a particularly challenging or stressful situation. The app has a lock code, is not connected to Wi-Fi and is inaccessible to the military. The app flags terrible days and alerts the soldier when those red flags add up to susceptibility to PTSD. Ausenhus designed the device as a small tablet, with a steel and Kevlar bulletproof covering. It can be worn suspended behind a bulletproof vest as a thin addition to body armor that can be used hands-free and privately. "At the end of a 30-day mission, the soldier can listen and hear the emotion experienced during events," Ausenhus said. "It's simply a way to record, 'This is what happened and this is how I felt.'" Ausenhus calls the device "Ruck up," which, in the military, means to get through a difficult situation. Cagley said it could also be useful for patients of grief counselors and other mental health practitioners.